Several Iowa towns host summertime sweet corn festivals, but perhaps the largest annual celebration of the popular vegetable is in the Dallas County town of Adel, located 20 miles west of Des Moines. Lori Broka is president of the Adel Chamber of Commerce. "We get people from all over the Des Moines area and Dallas County," Broka said. "We usually have around 10,000 people…that’s the number we kind of guess at." The 30th annual Adel Sweet Corn Festival opens Friday evening with the shucking of the corn. The ears are then refrigerated overnight. A parade takes place Saturday morning at 9:30 and then the cooked sweet corn is given away for free. Broka says all the corn is usually gone by early afternoon. "Sometimes it is…we go through somewhere in the vicinity of 7 tons of corn," Broka said. 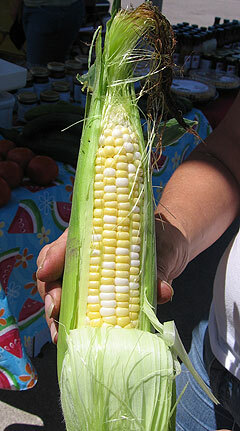 Seven tons is roughly equal to 15,000 ears of corn. The Adel Chamber of Commerce purchases the sweet corn for the festival from local farmer Ron Deardorff. Live entertainment, a 5-K run, a classic car show and more than 80 arts, crafts and food vendors are also part of the festival.